Either way, very impressive results; 77 cents per share excluding "one time" items, 34 cents better than expectations on only 10% year over year revenue growth. Obviously they can now raise guidance for fiscal 2009 - which they have: $416-425M v $379M consensus. Gross margins target 30-32%; operating margins 14-16%. Alternative fuel components maker Fuel Systems Solutions Inc (FSYS) posted a quarterly profit that beat market expectations helped by strong demand for alternative-fueled vehicles, especially in Italy, and raised its full-year revenue outlook. Revenue rose 10 percent to $116.2 million. For the third quarter, net income attributable to the company was $15.5 million, or 88 cents a share, compared with $11.9 million, or 75 cents a share, a year ago. During the quarter, the company recorded a gain of 11 cents a share related to an acquisition. "While the soft global economy continues to impact the transportation aftermarket and industrial businesses, OEM/DOEM (delayed original equipment manufacturer) transportation demand has gained momentum during the second half of 2009," Chief Financial Officer Matthew Beale said in a statement. 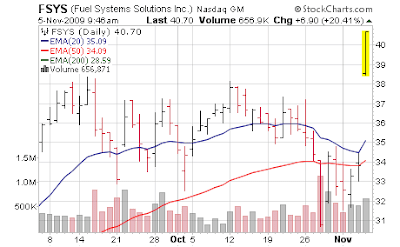 Fuel Systems, which acquired Teleflex Inc's power systems business, said demand from Europe will continue. For 2009, the company sees revenue of $415 million to $425 million, up from its prior view of $370 million to $380 million, driven by margin improvements and acquisitions. In 2009, the company expects a gross margin of 30 percent to 32 percent, and operating margin of 14 percent to 16 percent. In August the company said it was targeting 2009 gross margin of 28 percent to 30 percent, and operating margin of 11 percent to 13 percent.